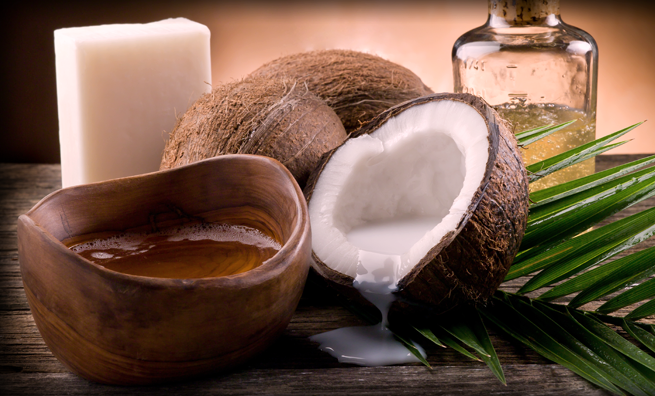 Virgin Coconut Oil is made from fresh coconut meat. According to the Codex Alimentarius, the VCO is oil and fat food produced without changing the oil, only obtained by mechanical treatment and heat usage is minimal. Virgin Coconut Oil is obtained from the coconut meat that is old but still fresh processed without heat, without adding any chemicals, processed in a simple way to obtain pure coconut oil is high quality. The advantages of this VCO is a clear, colorless, easy to rancidity and hold up to two years (Andi, 2005). Main component of VCO is saturated fatty acids about 90% and unsaturated fatty acids about 10%. Virgin Coconut Oil saturated fatty acids which are dominated by lauric acid chain C12. VCO contains lauric acid ± 53% and kapriat acid about 7%. Both are Medium Chain Fatty Acid (MCFA), while according to Price (2004), VCO contains 92% saturated fat, 6% mono-unsaturated fat and 2% poly unsaturated fats. Lauric acid is a saturated fatty acid with carbon chains are (having 12 carbon atoms), including the Medium Chain Fatty Acid or MCFA. In the body of MCFA have unique properties, which do not require enzymes to speed up penetrate wall of the mitochondria so that the process metabolism body will increase and energy is produced quickly and efficiently. The addition of energy produced by metabolic that produces effects stimulant throughout body. Other benefits can increase our energy levels and along with increased metabolism is improved resistance to diseases and accelerate the healing of the sick. With the increase in metabolism, our cells work more efficiently. Medium Chain Fatty Acid (MCFA) to form new cells and replace damaged cells with faster. Consuming VCO will also activate an anti-aging hormone, prevent heart attacks, dementia, obesity, cancer and other diseases associated with premature aging. Virgin coconut oil is one of the best cooking oil because it is very stable to high heat. With these properties, virgin coconut oil (VCO) can be stored easily at room temperature for years. The test of efficacy MCFA have been conducted, one with the use of VCO as cooking oil. From these test we got the result VCO is efficacious for increasing resistance to several diseases including viruses like HIV, Herpes simplex virus-1 (HSV-1), Vesicular stomatitis virus (VSV), Visna virus cytomegalovirus (CMV), influenza, and various bacterial pathogens including Listeria monocytogenes and Helicobacter pyloryd, and protozoa such as Giadia lamblia. 0 Response to "Components and Benefits of Virgin Coconut Oil"